What is a CADR rating? Equipped with a permanent filter, the Hamilton Beach TrueAir® 04383A is perhaps one of the most affordable air purifiers you can find. But, as we’ve said in other reviews… it’s not always all about cost. You don’t need to spend an arm and a leg to get clean air in your home or office. That begs the question… Is the 04383A worth considering? So who are the competitors? The first two we’d consider are the Honeywell HHT-011 and GermGuardian AC4100. Both of those purifiers are very close in price to the Hamilton Beach. All three are similar in a number of areas. For example, they’re all ARB Certified. They are also similar in size, and build quality. Best of all… the three offer HEPA filters. But, that’s where similarities end. The GermGuardian and Honeywell both add pre filters with activated carbon, which is great for fighting odor. Both are AHAM certified and therefore carry CADR ratings. But, those aren’t enough to completely win us over. If the GermGuardian and Honeywell were similar to Levoit’s slightly more expensive purifier; we’d be 100 percent against the Hamilton Beach. They are not, however. The two competitors are recommended for much smaller spaces. About half the size in fact. And if we’re being honest… the Hamilton Beach looks way better than the Honeywell. 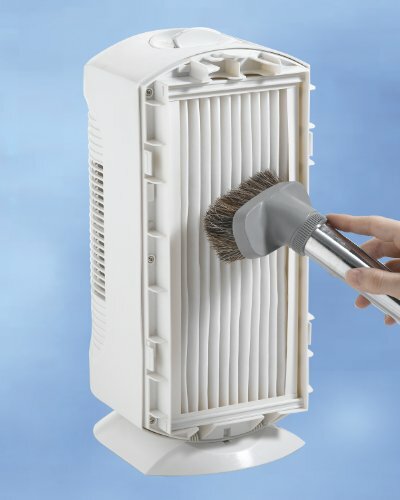 We’re not sure how a HEPA filter can be permanent, but this purifier evidently has one. At least that’s what the manufacturer says. But, for some reason Hamilton Beach also sells a replacement – permanent filter. Confusing, right? So… let’s just look past the odd use of terms and say that the machine does in fact have a HEPA filter. Which is great and… if it didn’t we’d stop here and say keep looking. The thing that disappoints us is the lack of a prefilter. And, that’s important because the HEPA filter in the TrueAir® is kind of a pain to change (maybe that’s why they say “permanent”). A prefilter would protect and extend filter life. With the unit’s sleek tower-shape design, the Hamilton Beach 04383 looks stylish and elegant compared to other budget friendly models. Another cool feature; you can place the unit anywhere in the room either in a horizontal or upright position. This machine is pretty straight forward. In fact the hardest thing you’d ever need to attempt would be a filter change. In fact operation is insanely simple. Plug it in and select a fan speed. There are three by the way. Hamilton Beach gives two of the three fancy trademarked names… but it’s essentially low, medium, and high. That’s it; pretty simple. The other thing you can do is add optional feet to the side of the machine and remove the base. You now have a horizontal mount purifier that’s a little lower profile. However, unless you’re using it on a desk or shelf with height restrictions… we prefer the small footprint “vertical” configuration a little better. And regarding that hard to change filter… Hamilton Beach recommends that you vacuum the filter every six months or as necessary to keep it clear. This is a fairly loud little machine. But, it’s not terrible by any means. Afterall, a lot of the more affordable options are a little on the loud side. It’s the price you pay (or maybe don’t pay) for a budget air purifier. Hamilton beach doesn’t publish an official decibel rating so we’ll avoid going into too much detail or compare their estimates to our readings. This little purifier is good for rooms as large as 160 Square Feet. Which is pretty good compared to similarly priced competitors. 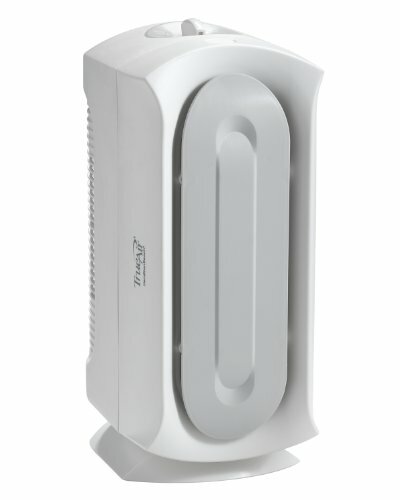 A the TrueAir® price point there are not many purifiers sized for this big of a space. However, if you’re willing to increase your budget a bit you can definitely see similar numbers. And, you can do so while getting the benefits of things like pre filters and activated carbon. But… for the price the Hamilton Beach’s coverage is impressive. Don’t expect too much though. If you place this in a large room, with poor circulation, it isn’t going to do much. The small size just can’t move enough air to make a huge impact. If we had one as a permanent fixture in our home… we’d probably keep it in a bedroom, walk-in closet, or bathroom. There aren’t a ton of features to discuss here that we haven’t already covered above. This machine is ultra simple. And, that is probably the main design feature we appreciate. This tiny air purifier is free of gimmicks and marketing hype you may find in other purifiers at this price point. It is backed by a Hamilton Beach 5 year warranty. Which is pretty solid… especially for a budget friendly purifier. Where is the best place to use this purifier? 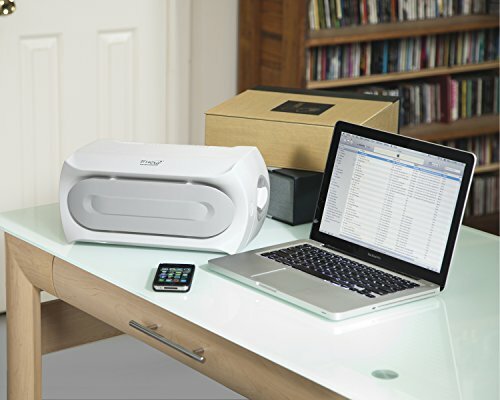 With the help of its removable base, the unit can bet set up on the desk, floor or shelf, either horizontally or vertically. That coupled with coverage for rooms as large as 160 SF make this a great option for large closets, craft rooms, the pantry, a home office, or smaller bedrooms. What can you filter with this purifier? Almost anything other than VOCs and odor. Airborne allergens such as dust, mold spores, pet dander and pollen down to 3 microns are easy for this machine to capture. Will this purifier remove odor? It will not. There is no material to adsorb gas or odor. You can however, buy cut to size activated carbon pre filter material at some home stores or online. As long as it’s a relatively thin material it should fit fine. You could also buy the 04384 model of this purifier… it includes Zeolite odor fighting filter media. Does this purifier have a filter change indicator? So… is it worth buying? We love how simple the Hamilton Beach is to use and service. And the price is tough to beat. But, there are some shortcomings as we mentioned above. So should you buy one? Yes. You will not be disappointed. This is a solid little air filter and should serve you well for years to come. If you can afford it, you might want to check out the a Blue Pure or Levoit. However… the Hamilton Beach 04383A works wonderfully. Smoke ’em if you got ’em. Choosing a cigar air purifier.